His paramount interest in Vitiligo surgery was the foremost motive to become one among the most successful researcher and expert of non cultured epidermal suspension transplantation in Vitiligo. 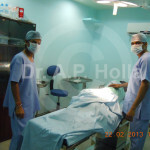 Internationally acclaimed Dr. Holla believes in result oriented procedures and not just in the number of procedures. He has around 1250 successful procedures to illustrate his dedication and result oriented treatment success in his 4-5 year long career. His inborn research mentality has shown him the path to modify procedure of Non Cultured Epidermal Suspension Transplantation, Follicular Cell Suspension Transplantation, Milligrafting, Mincegrafting and Follicular Unit Replacement Procedure.